Home » Pregnancy » Eating Well » When Do Pregnancy Cravings Start? We’ve all heard the stories… you’re about 12 weeks along in your pregnancy and all of a sudden you just gotta have pizza. Lots and lots of pizza. No sooner do you call the delivery guy when you realize you must have chocolate and pickles… with your pizza. Sounds like your pregnancy cravings have hit you full force! So, what causes cravings during pregnancy, when do they usually start, what do they mean, and how long do they last? Is it safe to indulge your desires and how do you deal with indigestion and heartburn that are sure to follow? When do pregnancy cravings start and how long do they last? Pregnancy cravings are different for every woman. Some notice the onset of cravings in the first trimester with a dramatic increase during the second trimester, and then a steady decline in cravings during the third trimester. Other women never notice any cravings at all. In some cases, a craving will come and go in a day or two, only to have a new craving show up a few days later. But don’t worry, your desire to eat strange things should disappear completely after delivery. What types of food do pregnant women crave? Some moms-to-be crave sweets, others want salty, some want spicy, and others even crave sour foods. Most women have at least one food craving during pregnancy, and not just for pickles and ice cream! Strange cravings, like black olives on cheesecake or salsa right out of the jar, are also quite common. What causes cravings during pregnancy? Often the cravings hit you out of nowhere, and they can be almost impossible to resist. But what causes them? Hormones are probably at least partially to blame. Pregnant women go through drastic hormonal changes that can affect both smell and taste, which is why food cravings and aversions seem to go hand in hand during pregnancy. Some healthcare experts believe that pregnancy cravings are purely psychological. But the truth is, no one knows with 100% certainty what causes pregnancy cravings. What do pregnancy cravings mean? Certain nutritionists and healthcare experts believe that there is meaning behind some cravings. They believe that certain cravings signal zinc, iron, or other deficiencies. In alternative medicine, for example, it is taught that a craving for chocolate means there’s a need for more magnesium in the diet. More research needs to be done to find out if there really is meaning behind pregnancy cravings, or if they are just random. At this point, there are no studies that prove a link between cravings and nutritional deficiencies. Should You Be Resisting Early Pregnancy Cravings? Being able to resist cravings is certainly positive as ensuring you maintain a healthy balanced diet is always recommended. Remember that cravings are not to be confused with your appetite, they are urges for very specific foods due to hormonal changes. Still, if you find yourself not being able to resist the urge from time to time, just try to eat small amounts of the food instead. Many women experience food aversions during pregnancy, too, and they often start around the same time as cravings. Meat is one of the most common aversions. For example, a woman who enjoyed meat before pregnancy suddenly can’t stand the taste or smell of it for portions of their pregnancy. In fact, this study shows a direct link between meat consumption and morning sickness. Food aversions could be caused by nausea and morning sickness that accompanies early pregnancy, but nobody knows for certain. Is it ok to indulge My Cravings? The most commonly craved foods during pregnancy are usually harmless. If you are craving healthy foods like meat, dairy, eggs, or fruit, feel free to indulge freely. Things like candy, ice cream, carbs, and fast food, while not generally recommended for the health conscious, are okay to indulge in, within reason. Pay special attention to how much junk food you’re eating and do your best to keep it to a minimum. Too many extra calories and sugar could potentially lead to problems with gestational diabetes and excessive weight gain. However, in unusual cases, women have reported craving strange nonfood items like dirt or soap. Very rarely, women crave dangerous substances like drugs or alcohol. In either case, get in touch with your doctor right away. Craving nonfood items could indicate a dangerous condition called pica and indulging in cravings for drugs or alcohol could be very dangerous for your baby. You should try to find healthy alternatives to satisfy your cravings whenever possible. For example, go for low-fat frozen yogurt instead of ice cream. In some cases, cravings for sweets might indicate a drop in blood sugar. Try eating frequent, small meals throughout the day to help keep blood sugar levels stable. Digestive Issues, Morning Sickness, and Cravings: How are they all related and what can you do about them? Digestive issues and morning sickness are common complaints during pregnancy. Much like cravings, these symptoms are considered to be normal side effects of pregnancy that will usually pass during the second trimester. Overindulging in your cravings could worsen digestive issues and even cause morning sickness. Additionally, the increase in hormone levels during pregnancy, as well as higher stress levels and fatigue, are believed to be leading causes of all three symptoms. In many cases, anti-nausea drugs and other pharmaceuticals are prescribed to combat these issues. Although conventional treatments can be effective in many cases, most moms-to-be would prefer to address their symptoms without taking pills. Alternative medicine experts at the Yinova Center recommend trying prenatal massage as a safe and gentle alternative. 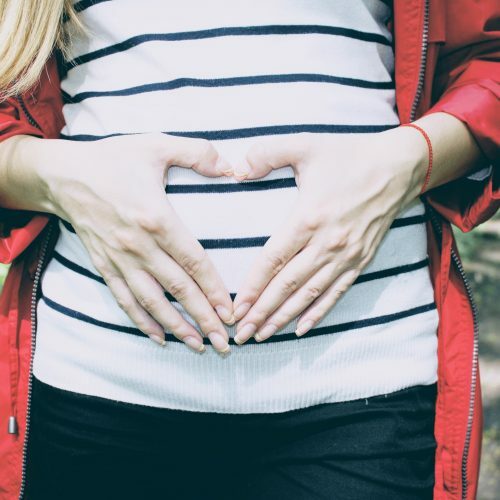 In addition to relieving digestive issues and nausea, regular prenatal massage during pregnancy reduces tension and leaves you feeling more relaxed and at ease, possibly making it easier for you to resist your cravings. There are additional benefits as well, including a reduction in anxiety and depression, which could also be contributing to your food cravings. A licensed prenatal massage therapist will also be able to offer tips on the right foods to eat, how to get better sleep and teach you relaxation techniques to support you during this stressful time. Although science has yet to prove what really causes cravings during pregnancy, one thing is certain. Just like most other pregnancy symptoms, the cravings will go away eventually. All of you moms-to-be craving pickles and ice cream can breathe a sigh of relief!